MANILA, Philippines - The National Police Commission (NAPOLCOM) on Friday, January 8, 2016 named the top 20 placers for October 25, 2015 PNP entrance and promotional examinations -Police Officer, Senior Police Officer, Police Inspector and Superintendent. Cezar Mark Padilla Gandeza obtained the highest place for PNP Entrance exam, 87.20%. Sixto Antonio Wakit topped the Police Officer exam with 88.40% average grade. Meanwhile, Bobby Dinglasa Oroyan got the top spot for Senior Police Officer promotional examinations. February 13 UPDATE: NAPOLCOM also announced Top 20 examinees for the Police Inspector and Superintendent exams. NAPOLCOM named a total of 2,600 out of 14,860 (17.50%) passers for PNP Entrance exam, 3,390 for Police Officer and 4,719 passers for Senior Police Officer promotional examinations. 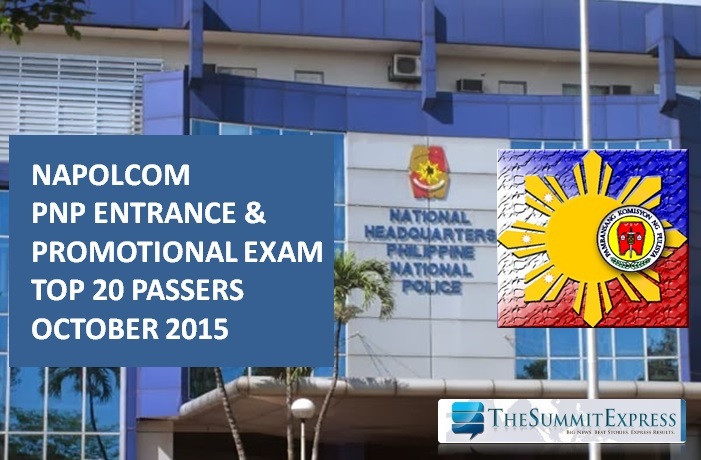 NAPOLCOM said that 20,059 examinees took the promotional test exams.